The AR-32A programming unit and adapters* are warranted against defects in material and workmanship for a period of 1 (one) year from the date of purchase. Clips and probes are wear items and are covered by an out-of-the-box replace or repair policy. Before a product will be accepted for warranty repair or replacement, a valid Return Material Authorization number (RMA#) must first be issued by Andromeda Research. You may obtain an RMA# by phone (513/831-9708) or email (arlabs@fuse.net). Instructions for shipping the the package will be provided when the RMA# is issued. Warranty repairs are normally completed within 2 to 3 days of package receipt. *The sockets used on Canon and Sharp boot rom adapters are subject to fatigue from use and are covered by a 60 day warranty. OUT OF WARRANTY REPAIR - Andromeda Reseach offers two repair options for out of warranty systems. OPTION 1 - Standard flat rate repair - $105.00. This repair option includes repair of the programming unit, installation of any hardware upgrades plus calibration and testing. Repair time is usually 2 to 3 days after package receipt. A valid RMA# must be obtained from Andromeda Research before the package is returned (see below). OPTION 2 - Expedited flat rate repair - $145.00. This repair option is provided for those customers who require the rapid return of their equipment. The Expedited Repair option provides same day repair service. You must ship the package to arrive at our facility by 10:30 AM eastern time. 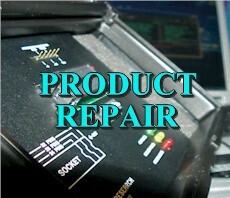 Your equipment will be repaired, any hardware upgrades will be installed plus the unit will be calibrated and tested. It will ship from our facility on the same day it was received by UPS next day air. A valid RMA# must be obtained from Andromeda Research before the package is returned (see below). Note: Expedited repair is subject to availabilty. ADAPTER REPAIR - Standard flat rate charge of $45 or 50% of the cost of a new unit. A valid RMA# must be obtained from Andromeda Research before the package is returned (see below). Before a product will be accepted for repair, a valid Return Material Authorization number (RMA#) must first be issued by Andromeda Research. You may obtain an RMA# by phone (513/831-9708) or email (arlabs@fuse.net). Instructions for shipping the the package will be provided when the RMA# is issued.